County Line Nursery is a family run nursery established in 1986. Most of the plants we grow are "shade loving" and many are fragrant and winter bloomers. We are a specialty nursery only growing a few hard to find plant species such as daphne odora, edgeworthia chrysantha, and several others. We also grow several hundred different varieties and species of camellias, one of which is Camellia reticulata which is difficult to propagate but is known for it's very large (7") blooms. Included on this site are photos and descriptions of many of the plant varieties we grow. Some of the varieties of camellias that we have in production might not be available at a given time and we are continuously adding to our offering. Most cultivars are grown on their own roots although some of the more difficult to root varieties may be available in limited quantities as grafts. Camellias have always been an important part of our business. Each plant we grow is carefully and individually hand pruned and fertilized. The Alden family invites you to visit us and see for yourself the care that goes into our plants. We are a wholesale nursery, but in the interest of serving the collector or individual who is having difficulty finding a particular plant, we will sell retail to customers who come to the nursery and also offer UPS delivery to a limited area. See section on pricing. 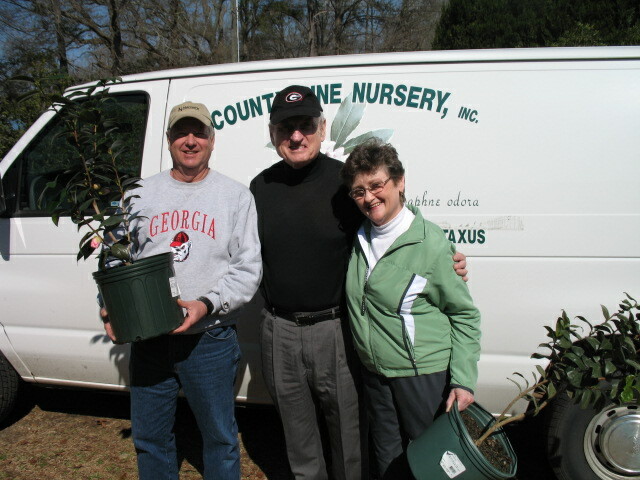 Brenda & Tommy Alden with Coach Vince Dooley who came looking for two special plants, a Camellia japonica 'Kickoff' and 'Touchdown'.